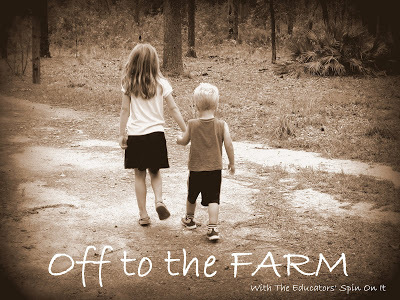 Discover our Farm Themed Tot School Weekly Plan. 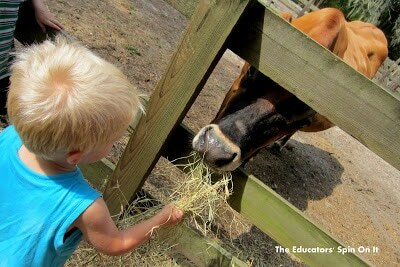 A week of farm themed music, art, science and math all focused on toddler fun with farm animals. The farm has been a focus on many tot school weeks. Although I as a parent, may tire of doing the same thing over and over again, my toddler has specifically requested to spend the week learning about the farm. Repetition at this age is SO beneficial and SO again, we are off to the farm! Ok, so we all know the classic “Down on Grandpa’s Farm” and “Old MacDonald” songs to sing with our littles, but if you haven’t experienced Laurie Berkner’s “I know a chicken” song, then you are missing out! Kids shake their “shaky eggs” (store bought or home-made) with the song and ECHO sing (or read) the words to the song. This catchy tune is SO silly, fun to sing, and great for teaching shaking to the beat! You can write the words to the chorus out and point to them as you sing them. This will develop early reading skills! I am sure there are a lot of great experiments out there. Honestly, it is fall planting season here and we went outside and planted lettuce, carrots, kale, peas, bok choy, and beets. We talked about what all living things need and my son helped to water the seeds after we planted them. These are called CRAFTS and not art or some would describe it as “product” art – meaning all kids products look very similar. Lacking in creativity, but focusing on following directions. Guess this week was more “crafty” than arty. 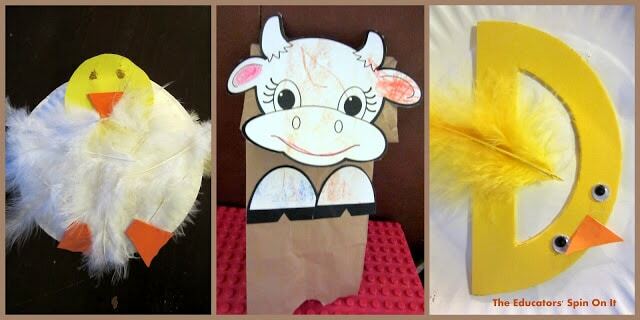 The funny thing is that my son chose to learn about the farm and when we went to story-time at the local teacher store – she read Farm books, did a dot cow painting and made paper bag cow puppets. Then, when I crashed a friends playdate (she did invite me to join her AMAZING group of mom friends and kids) they were talking about ducks. Don’t you love when weeks just come together!!!! In my opinion, it is important to do some of both kinds of art. Next week, I will focus on more open ended creative projects! If you don’t live on a farm, then now is a great time to stop at a farm! Many farms open their doors to visitors during the fall season. Check your newspaper or local online listings to see if there are any available in your area. For some reason, tots just connect with farm books and animals, but NOTHING compares to actually seeing them, hearing them, smelling them, and feeding them in person! 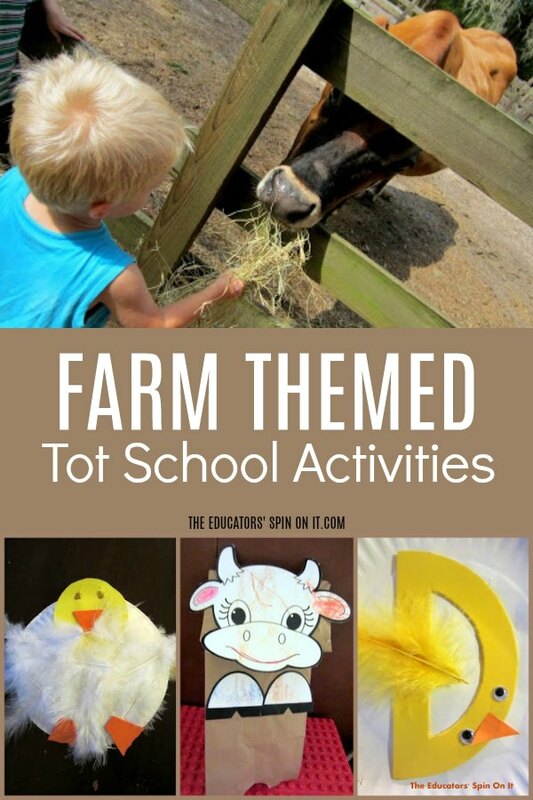 Click here for more tot School Themes and Ideas to go along with this Tot School Farm Themed Activities for your toddler. Looks like a fun week! I love how you have a learning focus for each day…what a great way to keep organized!